There’s a blurry screenshot of the play. Down by two with three seconds left, Ricky Rubio inbounded the ball to Kevin Love. Love took a dribble to his left and set himself for the game-winning (or tying? I can’t quite tell) shot. 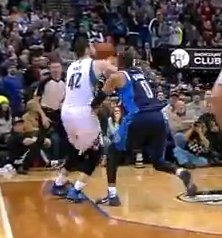 Shawn Marion then reached across Love’s arm and hand to tip the ball away. Replays confirmed that The Matrix caught at least Love’s hand, if not part of his arm. He must’ve bent the laws of physics too, because neither referee with clear sight of the play blew his whistle. The Wolves-fan outrage was predictable, but justified. Any NBA player deserves that call. But an MVP candidate playing on his home floor, on the last play of the game? As Adelman questioned after the game, what would happen if that were Dirk or LeBron taking that shot? The rhetorical question doesn’t even require an answer. 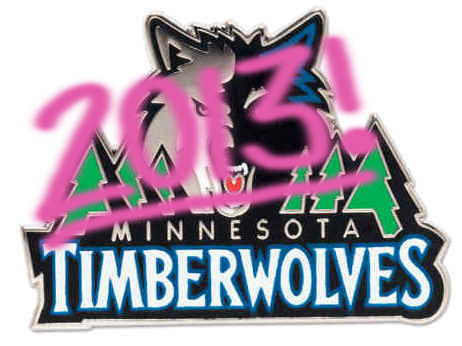 The Timberwolves are back to five hundred. On Friday night at Target Center, they beat the Wizards by 22. On Saturday night in Milwaukee, they beat the Bucks by the same lopsided margin. With these wins, their record is now 15-15; good for ninth place in the West. Taken together, the games’ eight quarters were like a sandwich made of stale bread, but with the finest meats and cheeses. The first quarter against Washington was rough. Well, the opening few minutes were rough, as John Wall came out hot and the Wizards led 9-0 on the Wolves home floor. The crowd started to groan. But the Wolves, led by Kevin Love, chipped away and cut the deficit to one at the quarter break. The Wolves next six quarters, second through fourth against Washington and first through third against Milwaukee, were a walk in the park. Shots went in. Turnovers were forced but not committed. Kevin Love and Nikola Pekovic were the best players on the floor. Corey Brewer scored on his fast-forward-button throws at the backboard square. Ricky Rubio organized an effective offense and bothered his opponent on defense. Against the Wizards, JJ and Shved played well above their norm. Against the Bucks, Kevin Martin was red hot. Quarter scores in this six-period stretch were all in Minnesota’s favor, save one tie: 39-24, 27-27, 32-24, 34-28, 30-27, 39-21. The fourth quarter in Milwaukee was that other slice of bread; the one with the mold on it. Rather than continue the focused offense and aggressive defense, the Wolves second unit let up. What was a 31-point lead with 51 seconds left in the third dropped to just 17, halfway through the fourth. Instead of subbing in rookies Gorgui Dieng and Shabazz Muhammad for some needed reps, Rick Adelman instead barked at his starters — Ricky Rubio, Kevin Martin, and Kevin Love — to get back in there. They won the game easily enough and upped the lead by five points before the final buzzer. But ending such a nice weekend of blowout-winning basketball with such a crappy final period was enough to upset Adelman. I’m sure he’ll use it as teaching point in prepping the team for its upcoming stretch of eminently winnable games. The Wolves will be favored to win their next six games, five of which will be played at Target Center. The effort and focus they put forth in the middle six periods this weekend will get it done. The performance bookending that excellence will not. This should turn around, and the Wolves have played the league’s second-toughest schedule — and one heavy on road games. In a group of flawed teams, Minnesota has the most potential to stabilize as an above-average two-way club. –Zach Lowe, in today’s Tuesday column at Grantland. Lowe runs through his Western Conference Power Rankings and slots the Timberwolves 8th in the conference; just ahead of the Mavs and just behind the Suns.